When Joseph lost two of his baby teeth a little earlier than normal, his parents thought nothing of it. But when two weeks later his gums swelled and caused him a lot of pain, they immediately took him to the doctor. It was the last thing they expected to hear when the doctor told them Justin was suffering from Burkitt's Lymphoma- a cancer of the lymphatic system. While Joseph's amazing strength helped comfort his family emotionally, the NCCS helped financially. 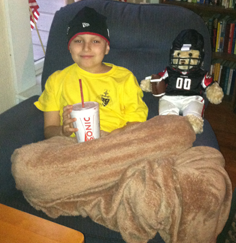 "The NCCS assisted us helped us get Joseph to treatment," said Tammy, Joseph’s mom. "Without the NCCS we couldn't have made it, because I was out of work to be with my son. Thank you so much." After undergoing 74 chemotherapy treatments, 12 spinal taps and one blood transfusion, Joseph is now in remission. "He is amazing person who shares his story with everyone," says Tammy. "He is doing well and hopes to return to school very soon."